So. What is the normal protocol for Valentine's Day? Spend time with your partner/spouse and possibly go out for a good meal. That sounds about right. Well, you gotta give it to Viv. Not only did we not go out for anything, I ended up meeting Mijune at Bubble World on Valentine's Day. Yah, I met up with another woman! To be fair, Viv knew about this and there was good reason. However, I need to watch it. Viv might be filing the papers at this very moment... So, the reason we picked Bubble World of all places is because it is open late. 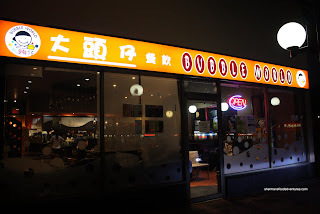 One of the original bubble tea joints in the GVRD, they added the "restaurant" portion to some of their locations to offer more than just drinks. If I had to make a comparison, the bubble tea at Bubble World may not necessarily be the best; but it is fine for what it is. Consider it the McD's of bubble tea. 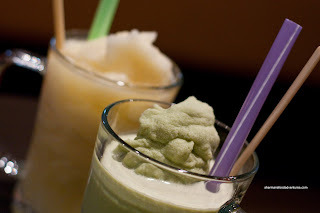 For myself I had a Lychee Slush with coconut jelly while Mijune had a combination of Macha and Coconut. We asked for low sugar and honestly, that works quite well since the bubble teas here are usually quite sweet. As for our food, we started with an order of a the Salty Peppery Chicken. 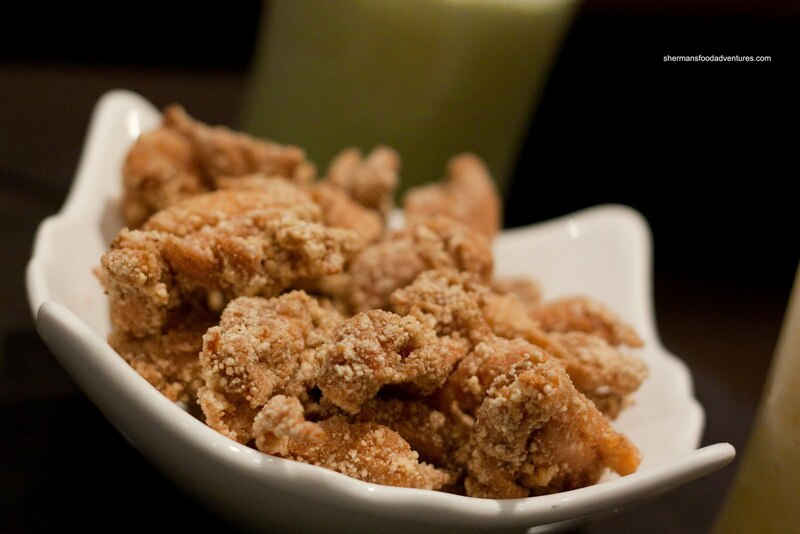 Although the pieces of chicken were tender and quite large, it fell flat in terms of flavour. In fact, the size of the pieces probably compounded the lack of flavour. It was slightly salty; yet hardly peppery. The attached pieces of chicken skin was not something we preferred either. I'm sure some people like it that way, we didn't. 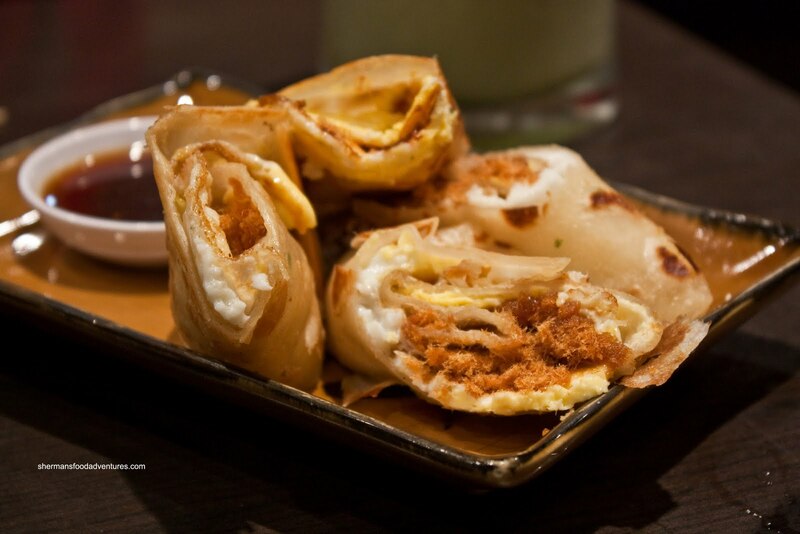 We got the Fried Egg & Pork Floss Wrap for our next dish. Now don't worry, it is not dental floss made out of pork (although that would be pretty cool), rather it is merely dried pork. The key to this dish is the pancake wrap itself since the pork floss is store bought and a fried egg is a fried egg. And the pancake was pretty good being thin, soft and easy to eat. It as served with a sweet oyster-based which, in my opinion, was not really necessary since the wrap was pretty flavourful itself. 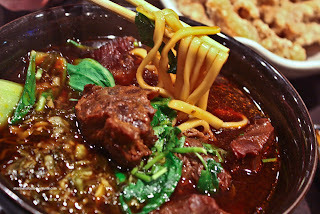 Despite the fact we both had already ate dinner, it didn't stop us from sharing a Spicy Beef & Tendon Noodle as well. Yes, we are dedicated eaters! We weren't holding out much hope for good food here, let alone a good Taiwanese beef noodle; however, it was decent. The soup base was flavourful being spicy and slightly sweet with a tart kick from the pickled greens. Yet, it did not have a lot of meat flavour nor depth. The noodles were slightly chewy and thick. As for the beef, it was not as tender as we would've liked. Let me rephrase that, the beef was tender; but the tendons within the beef were not. If you can believe it, this was my first time "eating" at Bubble World. I've had their bubble tea many times over; yet I've never had their food. From what we tried, it was a whole lot better than I had envisioned. Of course this is not the best of anything; but it does the job. This is only your 1st time? I just went there last week, and it's probably my 100x. LOL... I agree, their BBT is average, but at the same time really cheap. I recently went to Tri-ty in Richmond, and had a simple BBT that cost me almost $5 without pearls :(. Anyways, just want to say I was pleasantly surprised by their beef noodle too, cause it was actual good. One last thing, the next time you go, you have to try the Braised Pork on Rice, they use really big piece of pork belly and only $6.95 for a good portion. LOL Jenny. I never considered Bubble World a place to eat. But I guess it is serviceable. Meet me there for eats then!